Maybe you’ve tried to remain blissfully unaware, but how an animal is raised will directly affect how they taste -- especially when it comes to beef. Indulging in a steak (or any other beef dish) that came from a cow that ate a healthy grass-fed diet will make for a beefier, richer, more flavorful dish. Because of that, we teamed up with Will Horowitz, the executive chef at New York City’s Ducks Eatery, to come up with three comfort food recipes where Dakota’s Grass-fed Beef is the star. So while you’re braving freezing temperatures, slush-filled streets, and virtually zero sunlight for the next few weeks, you’ll at least have these warm, cozy (and beefy!) dishes to keep you company. If your only experience with sloppy joes happened in your elementary school cafeteria, prepare to have your mind blown. (And your stomach filled with happiness.) Horowitz’s recipe calls to sauté the beef with beer (!) and pair the sandwich with leafy broccoli rabe and smoky, melty cheese. The broccoli rabe will add a nice touch of acidity, presenting the perfect balance with the extra beefy flavor coming from the ground beef. This dish is ideal for a beginner home cook, too: it sounds fancy enough to impress an impromptu weeknight dinner party, but really all the work is in prepping the ingredients. Melt one tablespoon of butter in a medium sauce pot over medium high heat. Place ground beef in pot, season with 2 teaspoons of salt and lightly brown meat, mixing every couple of minutes. Once it begins to caramelize, mix in onion, garlic and pepper. Lightly stir all ingredients for 4-5 minutes until nicely browned. Deglaze by pouring in dark beer. Use wood spoon to scrape any browned bits stuck to bottom of pan. As soon as beer begins to boil, add in dry mustard, paprika, molasses, ketchup, fish sauce, hot sauce and brown sugar. Stir together and lower heat to medium low. Add salt to taste. In a separate pan place 1 tablespoon of butter and melt over high heat. Once hot, add in chopped broccoli rabe, season with 2 teaspoons of salt and lightly brown 3-4 minutes. Turn off heat and place broccoli rabe on the side to rest. Add remaining butter to pan on medium heat and use to toast inside of potato buns. To finish, pour the shredded smoked gouda into ground meat and stir. 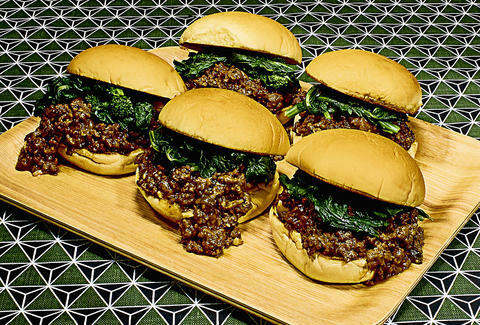 Generously scoop sloppy joe mixture onto each bottom bun and top with broccoli rabe. In a wide sauce pot or rondeau pan pour in olive oil and heat up on medium high. 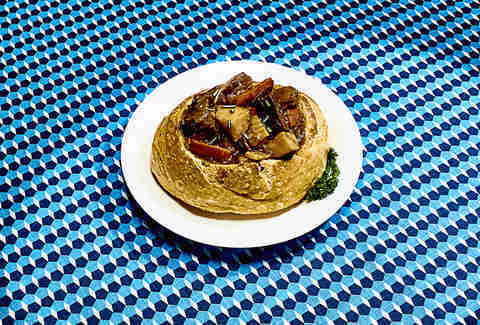 In a separate bowl, season stew meat with 3 teaspoons of salt and 2 tablespoons of flour. Shake off excess flour and place in hot olive oil. (If beef overcrowds the pan it can be seared in multiple batches.) Cook beef for 5-6 minutes, browning each side. Remove beef from pot and put aside, leaving rendered fat in pan. Keeping pot on medium heat, place sunchokes, mushrooms, shallots, garlic and fennel in rendered fat. Sauté vegetables for 3-4 minutes until lightly browned. Pour ½ bottle of red wine in, deglazing pot while lightly scraping any brown bits at bottom of pot. Add back in browned beef and bring red wine up to a bowl. Once wine has begun to boil add in beef stock, rosemary, black pepper, Worcester and tomato paste. Turn to medium low heat, cover with lid and cook 90 minutes or until beef becomes fork tender. To serve, cut circular hole on top of each sourdough boule and remove the inside bread, leaving the crust (and a bit of bread around it) intact. Ladle in beef stew and serve. Now, don’t be alarmed by the words “steak” and “gremolata.” A gremolata is really just a mix of freshly chopped herbs, and the steak only takes a few minutes on a grill or stovetop pan (if it’s way too cold to head outside). The brininess from the green olives and the acidity of the lemon juice will balance the richness of the dish, while the hazelnuts and sage add another warm, earthy element on top (that’s also ideal for winter). If you can’t find fish sauce, Horowitz recommends subbing in some Worcestershire -- both add more umami to the steak. Oh, and the best part about that gremolata? It’s the perfect thing to slather on some potatoes and serve alongside the steak. Mix together soy sauce, fish sauce, 2 tablespoons roasted garlic, mirin, cayenne powder and ½ cup olive oil in a bowl and pour over steak portions in Ziplock bags and marinate 4-6 hours. In a separate mixing bowl, add in rest of the roasted garlic, raw garlic, ½ cup olive oil, champagne vinegar, olives, hazelnut, and sage. Zest and juice both lemons and mix all ingredients together well. Season sauce with salt to taste. Remove steak from marinade, lightly season both sides with salt and allow to air dry at room temperature for 20 minutes. Bring oiled grill or pan to high heat and sear steaks 3-4 minutes on one side until golden brown. Flip steak over and place 2 tablespoons of butter in pan. Using a medium spoon baste top of steak with melting butter while browning other side. Continue to do this for 4-6 minutes while butter begins to turn brown. Cook steak to an internal temperature of 120℉ (keeping in mind the meat will continue to cook 5-10 degrees while resting). Remove steaks once finished and allow to relax for 10-12 minutes before serving. 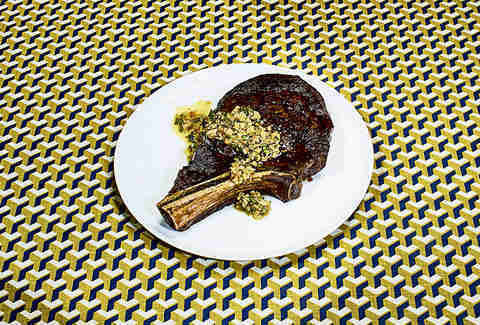 Slice steak and season to taste with salt, serve with gremolata sauce.